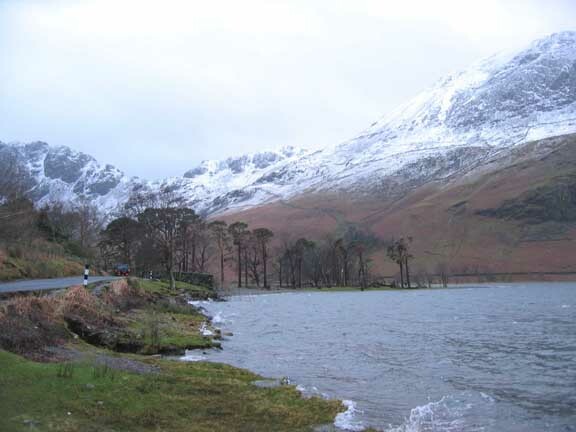 Location : The Buttermere Valley, Cumbria. 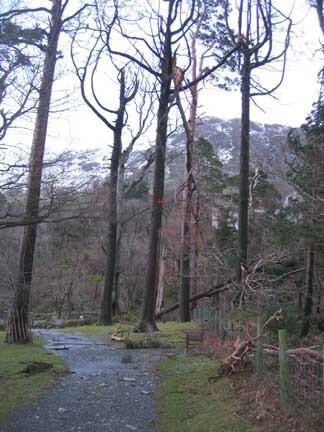 Occasion : Post-storm visit to check out the Buttermere Pines. Walk details :An afternoon walk along some of the lakeside path near Hasness. Weather : A grey afternoon, damp and overcast. The promised snow had not fallen for as long or as hard as forecasted. 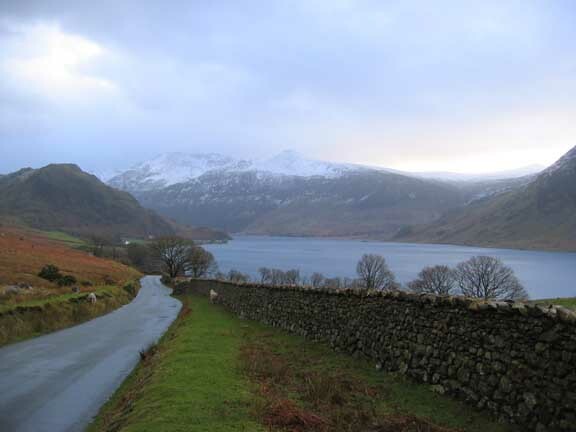 as we drive up the valley towards Buttermere. At Hawes point the water level is high but the lake relatively calm. 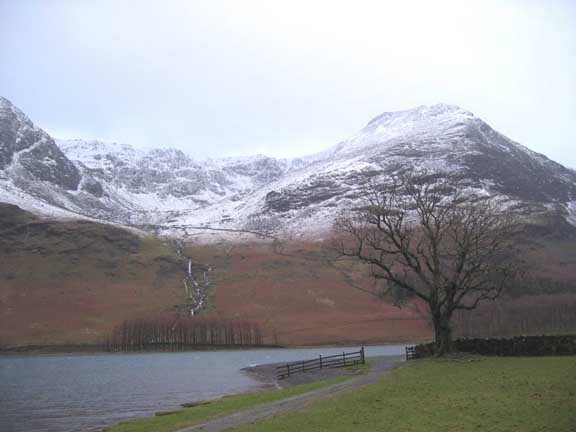 Low Fell at the opposite end of Crummock has a covering of wet snow. 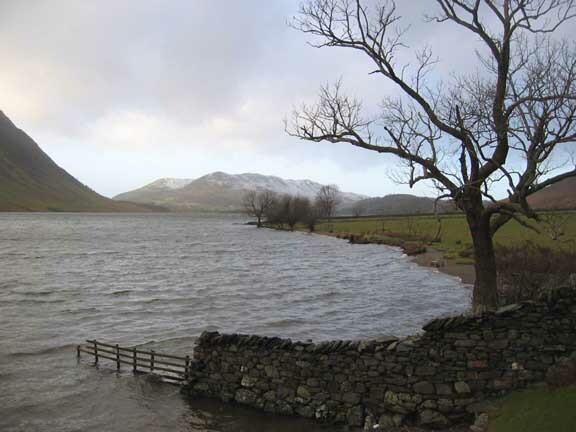 To get to the head of Buttermere Lake we passed through the wooded area around Hasness House. 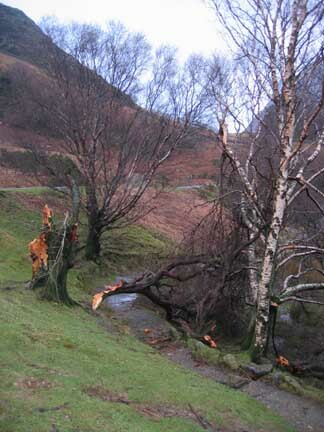 Several of the trees there , including some quite large ones, had suffered damage. As we parked near the top there was evidence of more damage. This old Hawthorn had succumbed to the gale and was currently lying across the footpath. 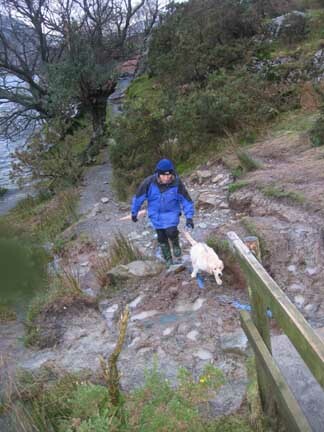 A month's rainfall in a few days and the path has also suffered. Here the stream has overflowed its small culvert and removed the surface from the walkway. 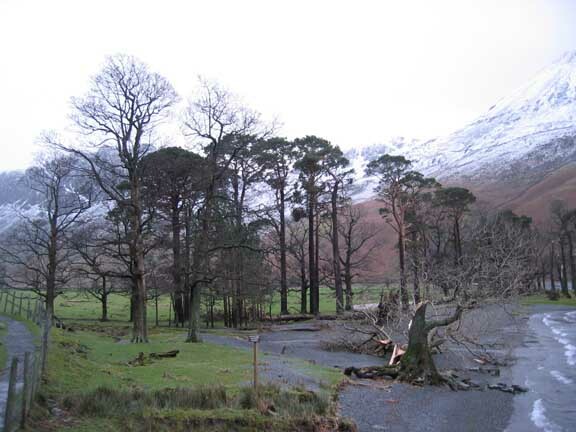 To our relief, however, the Buttermere Pines themselves were still standing. Most of them had suffered some form of damage, either small branches or in one or two cases whole limbs, but generally they had held up well. and I'm sure the shingle beach has been thrown further up onto the grass by the waves. Full testament to the power of the storms of last week. 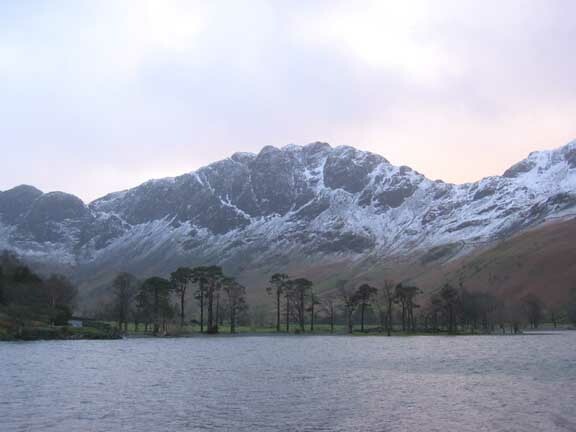 the view of Haystacks still retains its majestic foreground. Looking the other way, on the path to Hasness, this landmark tree has lost only a few smaller branches. 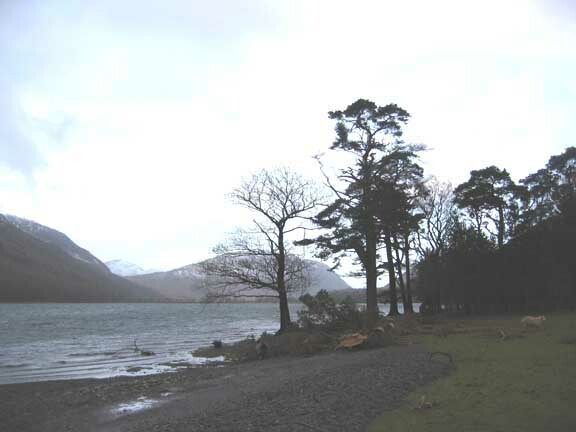 Further along though one tree has lost several significant branches which are lying across the shore path. with several of the trees down. 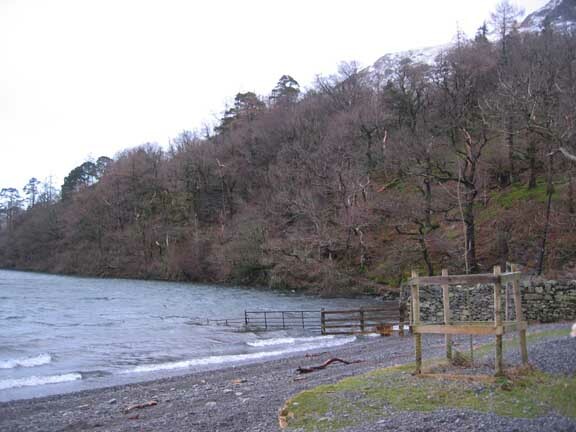 on the lakeside path towards the tunnel which runs below the main house. 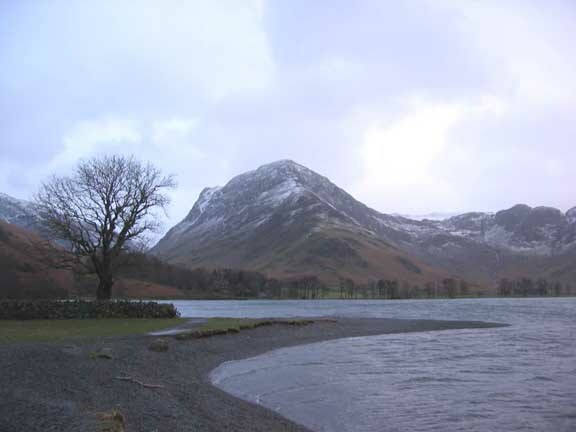 Returning now, with views back up to Fleetwith Pike . 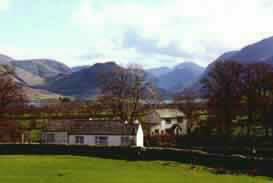 . .
and a fuller panorama of the head of Buttermere Valley. This site best viewed . . . with a pair of wellies.